This book develops the conclusions reached in Dispensational Truth. A dispensation is an administration, or stewardship. Jew, Gentile, Church of God, etc., provide dispensational distinctions as dealt with by God. Our Lord, rejected by the Jews during His lifetime was, after the crucifixion, offered again by God conditional upon the repentance of the nation. Our book reviews historical conditions and considers the epistles written during these years when God's offer was open to the Jewish nation and to such Gentiles who, as the figure shows, were grafted into Israel's olive tree. 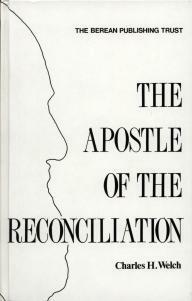 Romans, Galatians, and 1 and 2 Corinthians all contribute to the aspect of reconciliation. The purpose of God which is unfolded in the Scriptures proceeds from glory to glory, from the glory of a redeemed earth to the glory which is `far above all'. The climax of revelation is reached in the `prison epistles' of the apostle Paul. To make known the ministry of the apostle to the Gentiles, to point out its grace and its glory, to combat the antagonism of those who raise the misleading cry, `Back to Pentecost', to lead on to the heights and depths of the epistles of the mystery this is the goal, indeed the raison d'être not only of the present Volume, but of all the literature published in our name. `Who then is Paul, and who is Apollos, but ministers? ... we preach not ourselves, but Christ Jesus the Lord' (1 Cor. 3:5; 2 Cor. 4:5). Paul is but the mouthpiece, the channel. He who speaks is Christ. We are not worshippers of Paul, neither do we speak of his doctrine as Pauline. We do, however, `magnify' his office, realizing that in neglecting the witness of Paul Christendom is in reality turning away from the testimony of the risen and ascended Christ. In the present Work we seek to show the dispensational place of the Acts, and the earlier epistles of Paul. This in its turn provides a basis for the final revelation given to Paul, namely, the dispensation of the mystery, which is contained in the epistles to the Ephesians, Philippians, Colossians and 2 Timothy. The great keyword which dominates this Volume is Reconciliation. We believe that once the dispensational meaning of the reconciliation has been recognized, the Acts of the Apostles and the ministry of Paul will be appreciated at their true worth. While we realize that no one but a sincere lover of the Word of God will find much to his taste in these pages, we make no apology for taking the opportunity in the opening chapter of stressing the fundamental truth of the plenary inspiration of all Scripture. In such matters as archaeology and chronology we are necessarily indebted to those who have made these departments their special study; but for the main issue of the book we are alone responsible before the Lord. We take this opportunity of acknowledging the great help received from the writings of Sir W.M. Ramsay, particularly with regard to the archaeology of Asia Minor, the re-discovery of `Galatia', and the historical accuracy of the Acts generally. As to chronology, we have consulted numerous and ponderous works, but feel indebted particularly to the writings of Mr. C. H. Turner. In the preparation and criticism of the MS for and through the press, we have had the fellowship of several brethren and sisters in Christ, which we here most gratefully acknowledge. Should the Lord be pleased to permit us to reach the goal of our ministry, we trust to meet the reader once again in a subsequent Volume, which will deal with the epistles of the mystery. The present Volume, while complete in itself, would naturally form the basis of such a work. We now commend the testimony to the Lord, praying that it may be owned and blessed to many who shall find therein not only `seed for the sower', but also `bread for the eater'. `And when they were come, and had gathered the church together, they rehearsed all that God had done with them, and how He had opened the door of faith unto the Gentiles' (Acts 14:27). That this book may lead the reader to praise the Lord for that `open door' is the hope of the Author.